للمسافرين الذين يرغبون أن يعيشو كل ما تقدمه جولد كوست, Surfers Tropique Holiday Apartments هو الخيار الأمثل. يحظى هذا الفندق ذو 4 نجمات بمكان ممتاز يسمح بالوصول إلى المعالم السياحية الأكبر في المدينة، فهو يبعد مسافة 1.2 Km عن صخب المدينة. يضفي محيط الفندق اللطيف وقربه من كاسكيد, Royal Queensland Art Society, Brad Holmes Surf Coaching سحراً خاصاً على هذا الفندق. يقدم Surfers Tropique Holiday Apartments خدمات لا غبار عليها وكل أشكال اللياقة وحسن الضيافة اللازمة لإسعاد ضيوفه. تتضمن الميزات الرئيسية في هذا الفندق: صف السيارات, رعاية أطفال, غرفة عائلية, مرافق للشواء, جولات. بالإضافة لهذا,تتضمن كل غرف الضيوف مجموعة واسعة من وسائل الراحة . بعض الغرف توفر حتى غرف لغير المدخنين, مكيف هواء, مكتب, شرفة/ تراس, تليفون لإرضاء أكثر الضيوف تطلباً. كما أن مجموعة الخدمات الواسعة الموجودة في الفندق لضمان راحتك تترك لك الكثير من الخيارات لقضاء وقتك أثناء فترة إقامتك. إن Surfers Tropique Holiday Apartments هو خيارك لخدمة الفنادق الراقية في جولد كوست. يُرجى العلم أن شقق "سرفرز تروبيك هوليداي" لا تقبل الدفع عن طريق بطاقات ائتمان أمريكان إكسبرس. 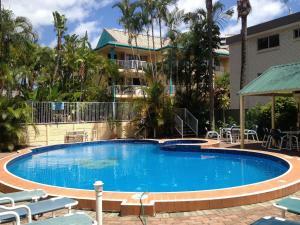 The apartment is located well within walking distance to city centre. The person at check-in was friendly. It has a pool and on-site parking. Underground parking has a height limit of 1.9m only. Our 4wd with roof rack only just managed to just squeeze in under this height. The 2 bed apartment we stayed really need some maintenance / renovations. We found a few things broken, missing bits or need repair - sofa (1 of the seat collapsed), microwave (missing dish), lights (one of the room missing a bulb) and washing machine (won't spin). Also, not all bedding materials were provided in the 2nd bedroom. The pillow feels a bit too soft. The apartment doesn't feel clean. Kitchen needed an upgrade. 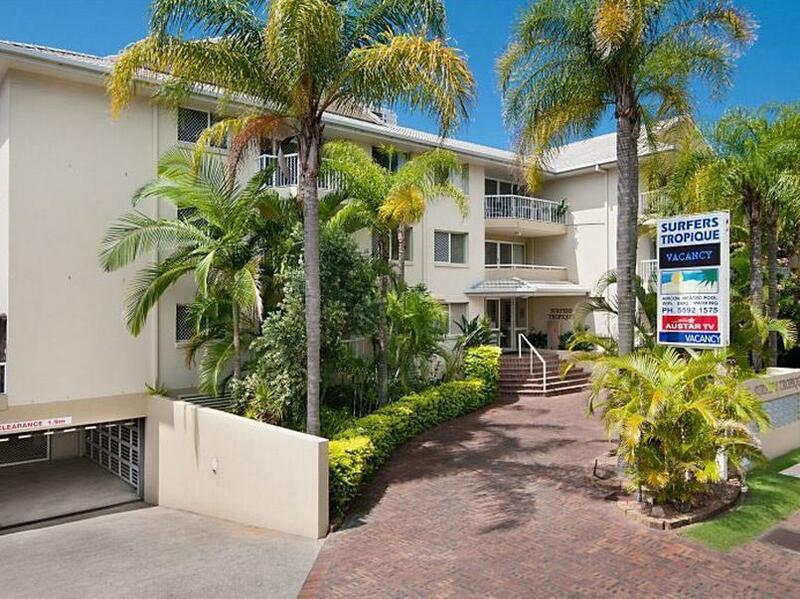 Spacious 2bedroom apartment within close walking proximity to the beach and shops. Can't beat that! Lovely pool. Room was clean and tidy. Peaceful neighborhood. No schoolies! There is no lift! Please be aware if you have problem with stairs. Luckily we were given a room on the ground floor (room 2), thus we 'only' need to lugged the luggages up 2 flights of stairs from the car park. During our 4 nights stay, the tap in the bathroom came off.... the lights in the living room and bedside table broke...although the staff did fix them pretty fast. Lights were generally dim. Pillow was so soft I had to stack 2 in order to sleep properly. No extra pillow provided. Kitchen was equipped.... but most of them were oily when we arrived. All other things ok. 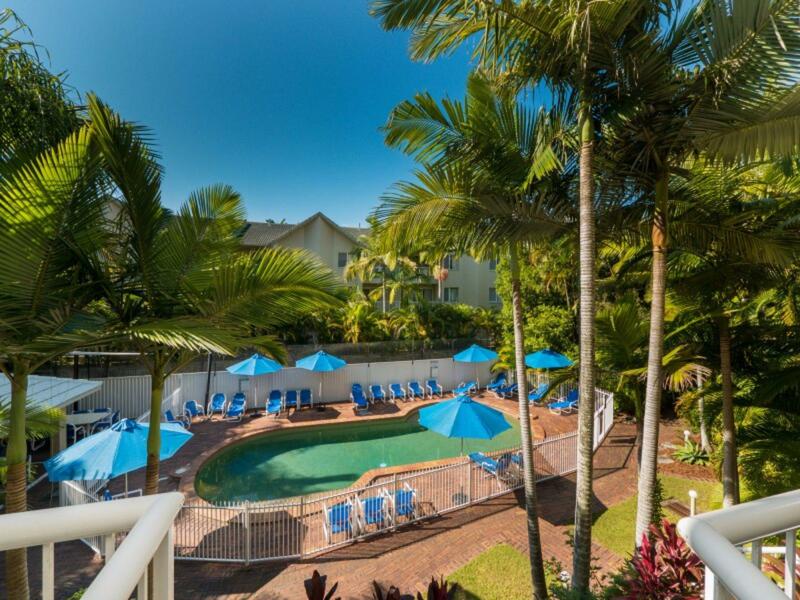 Location :It's a short walk to the beach. A short drive to Pacific fair shopping where we do most grocery from either Coles or Woolworth. Staff friendly but pool and rooms are just not up to standard. Have stayed at Mari court which is next door and the difference is miles apart though both rated 3 stars. There is no wifi unless you pay ( Mari court is free) again the cleanliness is terrible and the pillows are like Cotton wool in pillow cases. I will stay at Mari court it's a little more to pay but it is worth it. Our apartment was room 11 and it had a stale unclean greasy smell in the kitchen and rooms had stains on curtains and lounge. DVD player did not work. I could go on . Very disappointed . I booked this place, phoned them direct and requested a ground floor apartment because the stairs were going to be a problem for us. An email confirming that we had a ground floor was received then when we arrived we were told no ground floor apartment was available. The apartment we ended up in was terrible. It was not clean there was dried blood - amongst other dirty marks on the bathroom door. A bottle top on the floor in a cupboard. A couple arguing all afternoon downstairs. It was truly horrible and we were glad we were only there at night. I couldn't wait to leave. Furniture and furnishings were old and needed replacing. Convenience as 2mins walk to tram, 7mins tram to city (Opposite the tram has a Coles espresso and fuel station). The apartment is fully equipped with kitchen tools, washing machine, dryer, iron etc... But only provide a pillow pp =(. On the last day, due to have to check out by 10am and the apartment reception close earlier, we have to get a locker ourselves, and we found a $3 cheap big locker for 12hours in the basement of Islander resort hotel near Cavill avenue stop.